Numerous contributing photographers. Text by Lynn Kohlman. Assouline, New York, 2005. 80 pp., 170 color and b&w illustrations, 10¼x13¾". 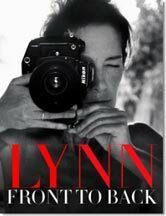 Lynn Kohlman began as a fashion model in the late sixties, appearing on the covers of all the major fashion bibles, as well as in advertising campaigns for such designers as Yves Saint Laurent and Missoni. In the seventies, her own photographs of male models attracted the attention of Andy Warhol, leading to successful stints at Interview, Vogue, GQ and Glamour. In 1989 Kohlman was appointed fashion director of the Donna Karan Company and later helped Tommy Hilfiger launch his women’s wear line. Throughout all these transformations, Kohlman’s signature style and humor prevailed. But, it was in 2002, when she was diagnosed with breast and then brain cancer, that one could really begin to see the depths of her dignity - and her beauty. This powerful visual chronicle, featuring memorable photographs by Stephen Sebring, Gusta Peterson, and Mark Obenhaus, is a unique record of one woman’s glamorous triumphs and agonizing struggles. Lynn: Front to Back gives new meaning to the notion that beauty is more than skin deep.